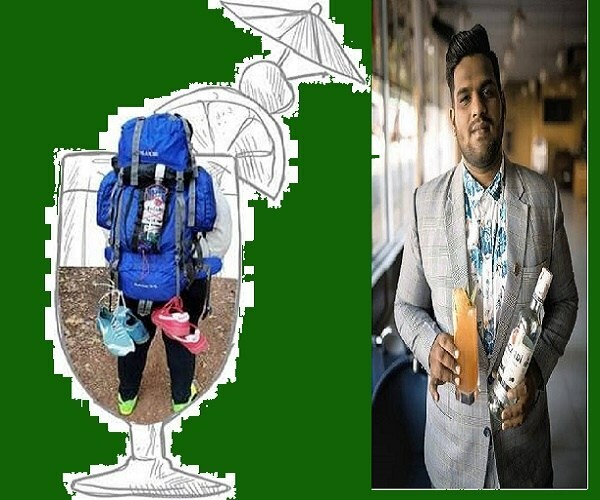 Devi Singh Bhati is travelling penniless across seven cities to promote a cocktail he created and compete at a global event. Leaving wallet: check. Empty pockets: check. No tickets or hotel booking: check. Backpack locked and stocked, thus began Devi Singh Bhati’s first leg of the journey from Goa to Hyderabad. This self-taught bar tender is on a 2400 km journey without a penny in his pocket. His plan to cover Goa-Hyderabad-Chennai-Kochi-Bengaluru-Pune-Mumbai-Goa by hitchhiking and accepting food and stay-invites from friends or random hosts. So by accepting tea, simple meals at dhabas from truck drivers and drivers of private vehicles, Devi Singh is enjoying his trip. All this, to promote a cocktail. As one of the top 12 finalists of Bacardi Legacy, Devi Singh decided on a unique way to promote the cocktail he had created — The Support. Instead of guest bar-tending, Devi Singh wants to go beyond the bar-room people to talk about his drink. “In return I get to know people, understand different cultures. Once I return I can narrate the story of my journey and the people I encountered back with the bar room guests,” he adds. ALSO READ: #SecretAgenda: "I’m Studying In Class 12 And I See How My Friends Are Falling Victim To RSS Rhetorics"
Devi Singh started his journey on January 3, armed with guidelines on hitchhiking and following a checklist for road travellers. “I love to travel. I always wanted to travel to see places and meet people. Work doesn’t let me take the kind of holiday I want to. And to be able to travel far and wide, I need a job that will pay my bills. So, I kept my plans pending. In 2017 I met my friend Niraj Ratnu who had travelled 10,000 km without money. He came back rich with experience and was in with the people of different states all over again. I couldn’t wait to do it but didn’t find the time,” he shares. Devi Singh’s determination to do something about his dream began turning into a reality when he participated in Bacardi Legacy, a global competition, despite being a self-taught bar tender. He began with bartending in Goa, first at Titos and he is now the bar manager at Love Passion and Karma (LPK) . “I was 15-years-old when I left house in 2009. I am from Jodhpur. After getting into bad company and doing fairly bad in studies, I quit and ran away from home. My interest was in the kitchen and I wanted to be a chef. After running away from home I did odd jobs and finally settled on being a security guard at a house. My father works at the services department in Ummaid Bhavan, Jodhpur. When he came to know about my whereabouts, I ran away to Bikaner where I worked as a tiffin delivery boy until I was cajoled by my uncle to return home for my sister’s wedding. Even though I ran away from home, I had kept in touch with relatives. So, that way my family knew I was safe. Once I returned home, everyone welcomed me. No one was angry or rude. That’s when I decided to stay back and learn to do what I want. I ended up teaching myself bar tending and when I knew I had enough to be behind a bar, I went to Goa,” recollects Devi Singh. Given this little tale of his life, Devi Singh tells people who give him company and agrees to listen to why he is hitchhiking when he could have easily planned and travelled. Devi Singh’s Instagram hightlights ‘The Journey’ story. There he is seen all ready to take on the road to literally begging people to stop, to sharing cups of chai or meals with with pickup truck drivers. A self-professed ‘non-walker’, Devi Singh was quite surprised when he walked for close to four hours to get a lift from Goa to cover a distance of 60 km. “I had my eyes set on the bright side. Sometimes I walked, sometimes I slept in trucks and sometimes I curled up in my sleeping bag. I was very sick in the first leg of my journey, but now I am better,” he says. Previous articleWhy Apsara Reddy, Congress’s First Transgender Office Bearer, Chose Politics Over London Lifestryle? Next articleWill The Films Are Only Way To Preserve Hyderabad’s Heritage? Why TDP’s ‘Political Experiment’ In Telangana Miserably Failed?